Welcome to my March 2014 Monthly Income Report! If you’re new here, every month I write a detailed report about my online earnings. I talk about exactly how much I’ve earned, where it came from, and (most importantly) the lessons I’ve been learning in and around my businesses. I do this because I believe in transparency and authenticity online, and if my numbers go down, I should tell you why. If they go up, you should know why too. It’s all here to help you learn from my wins and my failures (and there are a lot of failures too! ), and since I like to try new things and experiment, there will always be things to learn that can help you take your online business to the next level. I’m stoked you’re here! Now let’s get to this month’s report! Many of you are familiar with this phrase which is said during the intro of every episode of The Smart Passive Income Podcast. The philosophy can be applied to business and life on many different levels – from working hard and getting things done today so you have an easier day tomorrow, to working hard in the immediate future so you can enjoy life in the distant future. In March, I didn’t write a single blog post, and I didn’t record a single podcast episode. But, because of the hard work I put in during February, I was able to prepare all of March’s content beforehand, and as a result, it was almost like I had never left. Content continued to be published here on the blog, and I could focus on being present at the events I attended which were really important to me. Plus, of course, my other businesses which are more passive (because managing this blog is definitely NOT passive), and they continued to run like normal and generate an income as well. 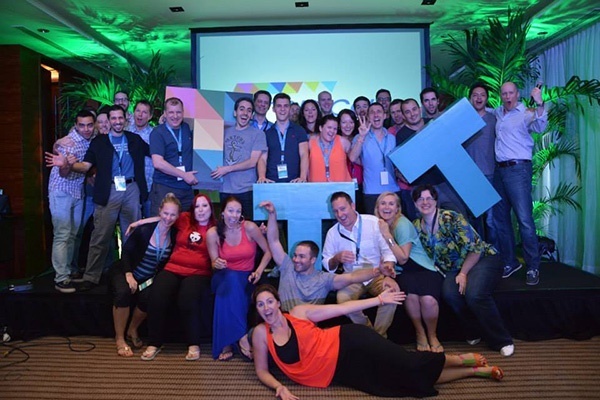 Tropical Think Tank – The Event of a Lifetime! Last year, I was invited to speak at Chris Ducker‘s event called Tropical Think Tank. It’s a premium, multi-day event that takes place in the Philippines that combines speakers educating on stage, high-level intimate masterminding, and incredibly gorgeous scenery. To say this was a trip I was looking forward to is an understatement! I arrived a couple of days before the event and stayed at Chris’s house, and it was awesome to hang out for a while with one of my best friends. I met Chris’s son for the first time, and connected with him right away. Most of our time together was spent playing legos, hehe. A couple of nights later, the speakers arrived. The all-star line-up included Amy Porterfield, John Lee Dumas, Greg Hickman, Natalie Sisson, Caleb Wojcik, and Gideon Shalwick. We had an amazing rooftop dinner that evening and the whole time all of us couldn’t stop talking about how crazy it was that we were in the Philippines together! The next day, the event started and I could go on and on about how amazing it was: the flawless execution by Chris and his outstanding team (Jam and Sian – you two were awesome! ), the postcard scenery, the excitement and take-action-ness from each of the attendees. It was amazing, and truly the event of a lifetime. A ton of memories came back home with me, and Chris – seriously (because I know you’re reading this), you put on a great show. Thank you! Besides the event and fun in the sun, one crucial stretch of time was a game-changer for my own business. The day after the speaker dinner, before the opening night get-together with the attendees, the speakers spent 8 hours in a conference room at our hotel to mastermind with each other. Each person got about 45 minutes to talk about their business – where they were at and where they wanted to go with it, and the rest of the group spoke their mind and offered their opinion and expertise. I’m in 3 mastermind groups myself, but they are all virtual and meet over the web or on the phone. This one was in person, with some of the top-people in the business in their own respective fields, so I knew I had to take advantage of this time. When it was my turn in the “hot-seat”, I talked about a project I’ve been working on for the past 3 months. I haven’t announced this to anyone beyond those in my team, and I even had to expand my team to help because this is a BIG project. It was clear, after talking to the group for 10 minutes, that I knew what I wanted to create…but not completely. A lot of questions were asked to clarify, and through that discussion alone, I was better able to hone in on exactly what I was working towards. I cannot reveal exactly what this BIG project is right now, but this coming fall you’re going to be very happy – this is something a ton of you have been asking for! Plus, this is something I’ve been wanting to do for a while, and it wasn’t until now that I got the help I needed, and have a clear vision in mind to actually make strides with it. After I got back from the Philippines, it was straight to preparing for my next presentation, which happened to be at an event here in my hometown of San Diego, called Social Media Marketing World. 2013 was the inaugural year for this event, and it was top-notch. So of course, I was excited to attend and speak at this event again this year. What makes this conference different is that its primary attendee is from the corporate world. They are the social media managers, the PR directors and directors of marketing at various companies around the world. This is unlike conferences like New Media Expo, which is catered toward entrepreneurs and solo (or small team) bloggers and podcasters. Most of the audience doesn’t know who I am or what I do, so it’s a great opportunity to work on my networking skills, including something I always try to improve: remembering names. There were over 2000 attendees, so there were a lot of names to learn! After reading a book called Moonwalking with Einstein a couple of months ago, my memory of names has improved, but it’s still not quite where I’d like it to be. It was fun to be in an environment where I could practice again, but more importantly it was great to meet new people, hear their stories, get more first impressions of what I do, and make new friends. Mike Stelzner, the CEO and founder of Social Media Examiner put on a stellar event. From an attendee and speaker’s point of view, it was flawless, and to have the opening party on the Midway aircraft carrier – just WOW. It was good to connect with many others in the industry at this premier event as well, such as Lewis Howes, Rich Brooks, Mari Smith, Steve Spangler, Jay Baer, Cliff Ravenscraft, Erik Fisher, and Michael Hyatt, among several others! Seriously, if you haven’t yet attended an event, it’s a must! I am, however, excited to be back home, settled in again and back into my work flow. I have a break from speaking until June, when I’m in San Diego again at Digital Co-Lab for a Keynote, and then the Problogger Event in August, followed by The Financial Blogger Conference, Agents of Change and finally Michael Hyatt’s Platform Conference. At Social Media Marketing World, I was asked to present about How to Get Your Podcast to the Top, which I was very excited to talk about. I’m putting together a slideshow and video for you that will be live in the near future for those of you who have a podcast or who are starting one very soon. The biggest takeaway from the event overall – podcasting is still on the rise, and it’s still in its infancy stage. A lot of people who attended my session had just started or were about to start their own. If you need help starting yours, I recommend checking out my free podcasting tutorial. No emails or payments required – just a commitment to get it done! I had mentioned failures earlier. Well, the SPI mobile app, which has been live on iTunes since July of 2011, can be considered a failure at this moment in time. I’ve failed to update it for nearly 3 years. It was working just fine when it came out in 2011. In 2012, the Twitter feed broke, but my in-app analytics said that wasn’t a huge deal (5% of users clicked on that tab). In 2013, the iPhone 5 came out with a larger screen, and I didn’t feel the need to update it. For anyone new to the app, imagine downloading an app and having it only fill up 70% of the screen. Not good. And finally, in January of 2014, the podcast feed broke. This happens with apps (and any sort of software that ‘speak’ or ‘talk’ with other platforms), and for an app to do it’s job and provide value, it needs to be updated consistently. I feel like I’ve let a lot of you down who have downloaded the app, and for that, I apologize. And there are over 30,000 of you – and many of you have probably deleted it by now. You’ll be happy to know, however, that I am making progress on a redesign, and it’s being coded as we speak! I think it looks great, and I can’t wait to have it be available again. I’m also going to work hard to get an android version available too, because I definitely kept those of you with an android device out of the loop by having just an iPhone app. You’ll hear about the app when it’s available (probably within 6 weeks), and of course, it’ll be free to download in iTunes. If you have it on your iPhone already, it should be updated automatically since I’ll just be replacing the old version with the new one. No not the kind of bar where you order a drink, but the kind of bar where you can order higher conversions! I ran a little experiment on my site at GreenExamAcademy.com (my business that helps people pass the LEED exam) this past month. I sell products of my own on the site, but I am also an affiliate for a company that sells practice exams. Over the past year, I’ve noticed that my affiliate earnings from the practice exams were actually exceeding the earnings from my own product offerings. If there’s one thing I’ve learned about building a business in professional education and test taking, is that practice exams sell! Well, instead of heavily promoting my own products, I decided to see what happens if I heavily promote the practice exams. The practice exams sell for $49.95, and I earn 50% on them, which is just a few dollars less than how much my own products (standalone) are selling for; $29.95. To help with promoting these practice exams, I hooked up the site to Hello Bar, a free tool created by Neil Patel that puts a horizontal bar at the top of the site. I can customize the copy, and where the button leads to. The copy you see above was the best performing bar out of three different Hello Bar’s that I tested, which converted at 2%. Another one was the exact same copy and call to action, with an orange color, which converted at 1.5%. And the last one I tested was the green color with just an additional word (“Get”) at the beginning, which converted at 1.42%. It’s interesting that the word “get” had the biggest impact on the test results. It’s also unfortunate because I cannot track visitors to sales conversions (since it’s an affiliate program, and when people click to the site, I have no idea if they convert or not. They don’t keep track of where they came from), but the visitor to click conversion is, of course, really important to understand too. So what happened as a result? My affiliate earnings for this product increased by nearly 50%, and my income from GreenExamAcademy.com for the month nearly hit $5,000.00. It’s been averaging between $2,500 and $3,500 over the past two years. Not bad for just 30 minutes of work, and I’ll continue to test and experiment with other copy, colors and call to actions. Speaking of numbers, let’s get to March’s income breakdown. My Bluehost earnings, once again, are on a huge upward trend. This past month, it’s partly due to Bluehost working on their own conversions on their landing page, and also because I saw a lot more traffic in March as well, due to popular podcast episodes and blog posts getting spread through social media. I also saw significantly more traffic coming from Google as well this month. In regards to Bluehost, please know that I do earn a higher than advertised commission with them, since I’ve been with them for a while and produce good volume for them. The earnings are NOT recurring – they are all for new customers, and if you’re interested to see where these links for Bluehost are located throughout the site, and how well each of them convert, you can read this article here. 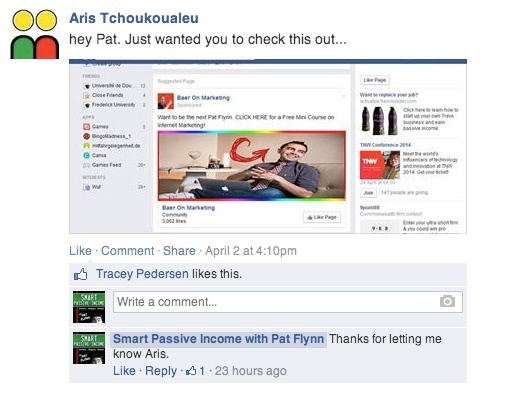 A significant portion of my total online income comes as a result of this very blog that you’re reading right now – mostly from the products that I recommend as an affiliate, which are products I’ve used or am extremely familiar with and have helped me in my own businesses. 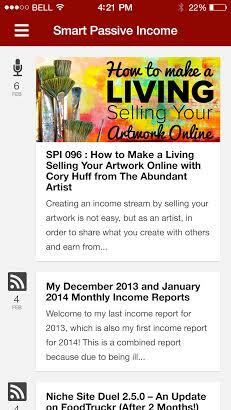 When I first started this blog back in 2008, I never intended to make any money from it. If you go back to my earlier income reports you’ll see that all of my income was coming from outside of this blog through other businesses. 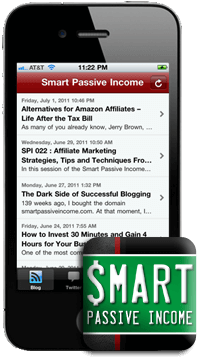 Over time, however, the SPI community has grown and as a byproduct of being helpful and giving away as much as I can, I started earning an income from this site too. Because I believe in total honesty and transparency, I decided to include the income from SPI on these reports as well. It wouldn’t feel right hiding this from you. My non-SPI related income has hovered around the $10,000/month mark for a while now, which is much more than I ever made working my 9 to 5 job in architecture, but I’m truly blessed that I have the support from an amazing community here at SPI who is willing to pay me back for all of the information I publish and the help that I try to provide for free. Some people go out of their way to make sure I get credit for an affiliate link, often emailing me to make sure I got it, which means the world to me. Thank you so much! It was such a cool feeling to have all of March’s content pre-written, pre-recorded and scheduled by the end of February so I could focus on the events I was attending in March. I’d love to do more of that in the future, and I probably will need to, especially around August and September. I’m personally having a hard time with this because it’s happening a lot now lately. It takes me a lot of time to figure out who is running these ads, using my name, my trademark and my images and put a stop to it. On one account, I had to have conversations with three different affiliate companies before finding out who was behind it so it could stop. Another time, my name and brand was associated with an image of a woman that I wouldn’t want my kids to see. Another time, someone actually created a Facebook page using my name and my face, and started to impersonate me. Yes, imitation is the sincerest form of flattery. Many people tell me that, and I understand that. 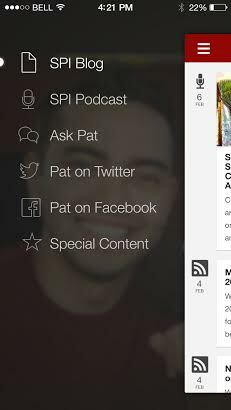 For example, since I started my new podcast AskPat, many others are coming out with their own version now too. Some with “Ask” in the title as well. This, I am flattered by. My idea was good enough that other people have adopted it to their own voice and style for their own audience. I love that, and it’s validation that I’m doing things right. 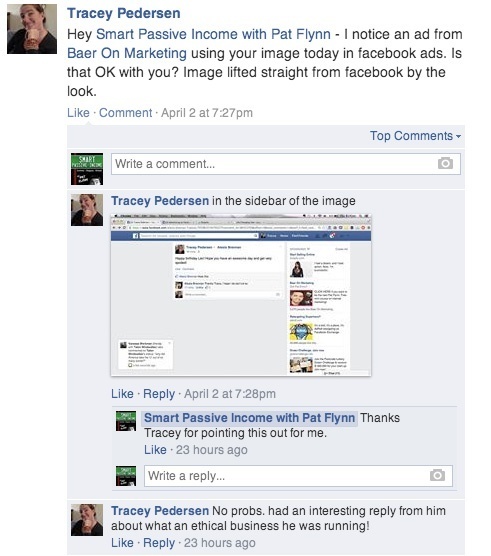 But these people with the ads who aren’t providing any value in any way, but are just using my stuff – that’s not cool. It upsets me because they’re piggybacking off of the audience that I’ve built, targeting YOU on Facebook, and using my stuff as a way to lure you. Beware, because I do not endorse or sign-off on ANY of these kinds of ads. It also upsets me that people think in the long-term, that this strategy will work. They obviously know who I am and hopefully what I stand for, and I never talk about or promote any strategies quite like this. So the big lesson here is that this is just another one of those dark things that comes with putting yourself out there and sharing your success. I’m happy to do it, because I know it helps and inspires a ton of people (just look at this Facebook post from earlier today, and how many other people in the comments have taken action too), but there are negatives that have to be taken into account too. I suspect more of this kind of thing in the future, and all I can do is deal with it as it comes. On a positive note, you are amazing, and thank you for taking the time to read this month’s report! I appreciate you!